This elegant, 19th-century hotel has modern rooms and suites that feature free Wi-Fi, room service, flat-screen TVs, minibars and safes. Amenities include free breakfast. There's also a lounge, a gym, and a rooftop terrace with a hot tub, as well as a restaurant, a bar and conference rooms. NH Bologna Villanova offers free Wi-Fi and free outdoor parking, 10 minutes drive from BolognaFiere Exhibition Centre. It is 7 km from the city's historic centre and features a fitness area with indoor swimming pool. Elegantly furnished, hotel rooms have air conditioning and a satellite TV. This upscale property, classically decorated rooms with parquet floors all feature free Wi-Fi, flat screen TVs and minibars. Suites add sitting rooms and en suite whirlpool tubs. There's a complimentary breakfast buffet and parking. Other amenities include a restaurant with a terrace, and a seasonal outdoor pool and hot tub. Al Cappello Rosso is one of Bologna's oldest boutique hotels. It combines 600 years of hospitality with modern facilities to ensure a pleasant stay next to Piazza Maggiore, the city's main square. All rooms come with free Wi-Fi and an LCD TV with satellite channels. 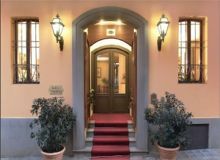 Hotel Corona D'Oro offers a great position in Bologna city centre. It is just down the street from the Towers. Free wired or Wi-Fi access, and free and rich buffet breakfasts are available. The Hotel areas are wheelchair accessible. Room service, premium bedding, and hair dryers are available to guests. Rooms at AC Hotel are spacious and come with a minibar and air conditioning. You can catch a bus directly outside the hotel that connects you to Bologna Central Station in just a few minutes. Hotel is located at the heart of Bologna so there is plenty of attractions nearby for you while u visit. Rooms at the NH Bologna De La Gare come with classic or modern décor, a work desk, and a private bathroom with a hairdryer and toiletries. The Amarcord Restaurant is open daily for breakfast, lunch and dinner. It serves Emilia-Romagna specialities, vegetarian and children's menus. The Hotel Touring is a lovely and comfortable hotel containing plenty of activities that allow guests to relax and unwind, these includes soaking in the Jacuzzi, sunbathing, drinking by the bar and eating delicious food at the restaurant. Plenty of nearby tourist attractions (museums etc) are within a 10 minute walk of the hotel. Hotel Internazionale offers a restaurant and free Wi-Fi in the lobby. All air-conditioned rooms have a TV and private bathroom. With simple wooden furnishings, rooms at the Internazionale include a private bathroom complete with hairdryer and toiletry set. Some rooms offer sea views.